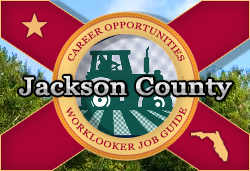 Looking for a job in Jackson County Florida? The following guide provides a listing of Jackson County top employers to include local government employment portals, healthcare job links, and a variety of schools that provide great teaching and support staff careers. Jackson County posts job openings when vacancies exist. During this review there were open positions available such as Library Children's Services Manager, Bridge Maintenance Technician, Correctional Officer, EMT Firefighter, Paramedic Firefighter, and Equipment Operator. Check for updates. The City of Marianna often posts open positions. Jobs found during this review had included Information Systems Tech IT, Utility Services Cashier, Recreation Assistant Aide, Police Officers, Auxiliary Firefighter EMT, and Water/Waste Water Utility Tech. To be considered for employment with the City of Marianna,interested applicants should contact Career Source Chipola formerly known as One Stop Career Center at 850-633-4419. Jackson Hospital is a 100-bed community healthcare system committed to quality, service, and growth. During this review there had been a high volume of opportunities available. Jobs surveyed had included ARNP Full-Time, Assistant LAB PRN Laboratory, Assistant Director HIM, Cardiac Rehab Coordinator, Certified Nursing Assistant Medical Surgical, Certified Nursing Assistant PCU	Progressive Care Unit, Coder HIM, ER Registrar, House Supervisor, Medical Assistant, Monitor Tech PCU, RN Medical Surgical, LPN Medical Surgical, Respiratory Therapist, Staff LPN, Staff RN Emergency Department, Registered Nurse Labor & Delivery RN, PRN Nursing Jobs, PRN Registered Nurse, Staff RN SCU Special Care Unit, Staff Therapist Cardiology, Technician EVS Environmental Services Jobs, and Ward Clerk. Signature HealthCARE at The Courtyard was hiring for the positions of CNA Certified Nursing Assistant, RN Registered Nurse, LPN Licensed Practical Nurse, and RN Supervisor. The mission of Florida Therapy Services FTS upon its inception was to meet the growing need for mental health services for our senior citizens and disabled population residing in assisted living facilities. Here you may find employment opportunities for positions such as Licensed Therapists (LMHC, LCSW, LMFT), Targeted Case Managers, and Master's Level Therapist. Chipola Health and Rehabilitation Center seeks passionate, dedicated individuals that want to work with an innovative company. If you are looking to establish a successful career in Public Health, you have come to the right place. Please take a look at the recent vacancies that we have available within the Department. North Florida / South Georgia Veterans Health System provides challenging and rewarding careers for healthcare professionals with great benefits and advancement opportunities. The VA is a technologically advanced healthcare system driven by a team of compassionate professionals with the aim of providing veterans and their families the best possible care. Nurses and Mental Health Professionals will find there are job opportunities available throughout the country. The Jackson County School Board employs over 500 teachers, instructing over 7,000 students in 17 school sites. The Jackson County School Board hires for a variety of certified and non-certified support staff positions. Employment listings may include careers such as School Custodian, School Nurse, ESE Teacher, Certified School Counselor, Speech Language Pathologist, Paraprofessional, Kindergarten Paraprofessional, Early Childhood Assistant II ESE, Art Teacher, PE Teacher, Kindergarten Teacher, Social Studies Teacher, Math Teacher, English Teacher, School Secretary, Teaching Assistant, School Guidance Counselor, and Bus Driver. The Jackson County Floridian links to Wiregrass.jobs. Craigslist Panama City Help Wanted / Clasifieds had open positions such as Painter, Handyman, Legal Secretary, Carpenter, Registered Nurse RN, Structural Welder, Accountant, Accounts Payable Specialist, Billing Specialist, Custodian, Housekeeper, Bookkeeper, Receptionist, Administrative Assistant, Clerical Jobs, Clerk, Dispatcher, Landscaping Jobs, Janitor, Housekeeping Jobs, Cleaner, HVAC Jobs, Secretaty/Receptionist, Roofer, Customer Service Representative, Medical Biller, Dental Assistant, Office Assistant / Counter Sales Position Available, and more.